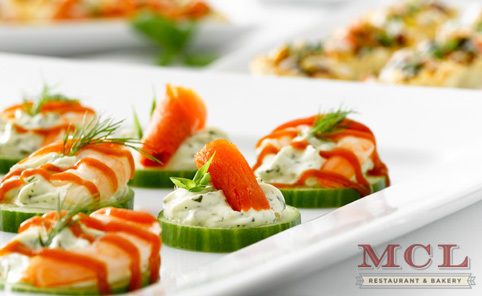 From cucumber rounds with smoked salmon to fresh vegetable platters, MCL hors d'oeuvres are the perfect beginning to any celebration. Treat your guests to our classic homemade meatballs or smoked gouda and turkey pinwheels while they socialize and mingle before the main event. For Full Service occasions, hors d'oeuvres will be displayed or distributed by severs based on the needs of your event. MCL hors d'oeuvres can also be added to any Family Style catering order. There is never a minimum order requirement for hors d'oeuvres picked up at an MCL location!